For three years, a group of researchers has been cataloging incidents like the kidnapping of schoolgirls in Chibok. One month ago, as people around the world celebrated Holy Week and Passover, Nigeria suffered its "worst week for violence and carnage" since the country's 1967-70 civil war, according to John Campbell, a former U.S. ambassador to the country. Yes, more than 200 girls were kidnapped from a school in the northern Nigerian village of Chibok. But that wasn't all. The Islamist militant group Boko Haram, which carried out the kidnapping, also blew up a crowded bus station outside the capital. Gunmen abducted a local lawmaker's sons. A mob lynched a suspected kidnapper up north. Sectarian violence killed seven in the east. Initially, before #Bringbackourgirls and the deployment of U.S. drones to do just that, Nigeria's most violent week in four and a half decades received little attention outside the country. That's not to say nobody noticed. 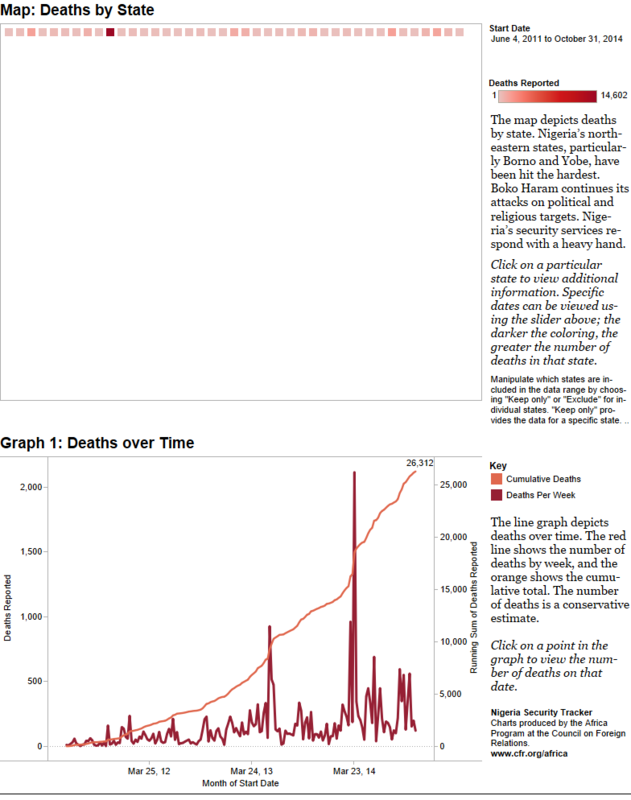 For a small group of researchers at the New York-based Council on Foreign Relations (CFR) who've been tracking Nigeria's souring security situation for the past three years, the incidents registered in the grisly Boolean search they'd set up to crawl the web for this very information: "Boko Haram," "kill," "killed," "dead," "death," "violence," "raid," "robbers," "gun," "bomb," "gunmen," "attack." The team entered the events into an Excel spreadsheet, coded them, and then visualized the violence using Tableau software, generating the image above—a color-coded snapshot of a horrific week. The "Nigeria Security Tracker," and the maps and charts it generates every week, can't possibly capture the complex dynamics behind Nigeria's instability. But they do provide valuable context as we try to understand the kidnapping in Chibok and the broader violence plaguing the country. The idea for the Tracker, Campbell told me, sprung from his "frustration over the imprecision about how many people were being killed, where it was happening, and the extent to which it was political versus criminal. In Nigeria, there's been a progressive breakdown of law and order, which means there's a lot of criminal activity which may or may not be political." Campbell, who served as ambassador to Nigeria from 2004 to 2007, launched the initiative to coincide with Nigerian President Goodluck Jonathan's inauguration in May 2011—a pivotal moment for the country. Jonathan, a Christian from southern Nigeria, assumed power when his predecessor, Umaru Yar'Adua, a Muslim from northern Nigeria, died in office in 2010. The next year, Jonathan made the deeply divisive decision to run for president, arguably breaking with an unwritten rule that his People's Democratic Party (PDP) had adhered to since the return of civilian government in 1999: alternating presidential power between the predominantly Muslim north and predominantly Christian south. (Yar'Adua had only partially completed the first of an expected two consecutive terms, so some argued that the PDP candidate in the 2011 race should have been a Muslim northerner.) Hundreds of people died in a spasm of post-election violence up north. Jonathan's victory, Campbell said, "led to the splintering of these cooperating and competing elites—the consensus that had held the whole ramshackle structure together broke apart." Meanwhile, he explained, the increasingly impoverished north is struggling with challenges like "power shortages, the collapse of the textile industry, underinvestment in agriculture, and desertification and climate change, which is driving herdsmen south, where they collide with farmers." The Tracker also emerged amid the rise of Boko Haram, which was founded in 2002 by the Muslim cleric Mohammed Yusuf in Maiduguri, the capital of the northeastern state of Borno. The group, which rejected the Nigerian government and instead advocated for an Islamic state, didn't turn violent until 2009, when a heavy-handed police crackdown on its members sparked a week of heavy clashes that left 800 dead, culminating in the killing of Yusuf in police custody. Boko Haram briefly went underground, Campbell said, before roaring back in 2010 and 2011. Boko Haram insurgents, now under the leadership of Abubakar Shekau, have been battling Nigerian security forces ever since, with the bloodshed concentrated in Borno State, where the militant group originated, but spreading to other regions and occasionally spiking, especially in recent months after the government imposed a state of emergency in several northern states. The numbers above only tell part of the story. They don't tell you who the perpetrators and victims of the political violence are. To accomplish this, CFR's researchers divide actors into categories—distinguishing, for example, between Boko Haram's attacks on civilians and its clashes with Nigerian security forces, who themselves have been accused of committing human-rights violations. There's also a category for "sectarian violence"—ethnic and religious violence concentrated in Plateau State, in central Nigeria. "Herdsmen who are Fulani, who are Muslim, are fighting with farmers who are Christian, who are Berom," Campbell explained. Tracking clashes between Boko Haram and security forces is a particular focus of the project. "There is virtually no judicial process involved in this at all," Campbell said. "Nobody has been held accountable for the murder of anybody. When people are detained by the security forces, they cannot enter any kind of judicial process. They're just warehoused. And in some cases they are then murdered." But violence in Nigeria—like violence anywhere in the world—defies neat categorization. After all, the sectarian violence in Plateau State isn't the only conflict in Nigeria with a religious dimension—the state's faceoff with Boko Haram has one too. "Boko Haram's stated goal, if you listen to the rhetoric, is to establish God's kingdom on earth through justice for the poor by the imposition of rigorous sharia law," Campbell said. Then there's deciding when Boko Haram fighters are the aggressors, and when Nigerian security forces are. If troops raid a Boko Haram camp in the Sambisa Forest, the CFR team would classify the state as the aggressor. But if the military and the insurgents meet on a road and clash, both groups would be categorized as perpetrators. It's the messy business of trying to make sense of an incredibly fluid conflict. I asked Campbell how he would advise a U.S. official looking at these numbers and contemplating ways to aid Nigeria in its search for the missing schoolgirls. "First, do no harm," he said "The more we are involved with assisting the Jonathan government, the more likely it is that Boko Haram turns to international sources of support. [The conflict in Nigeria] could become internationalized." "The friend of my enemy is my enemy," he added.